KITEBOARDS SLINGSHOT, SURF & PLANCHE by H2O KITE. 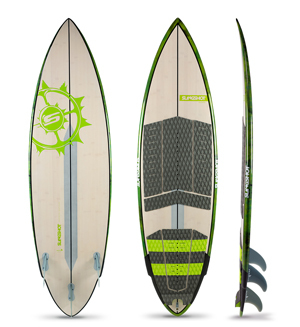 Kiteboard Surf Slingshot avec la Tyrant, Celeritas, Screamer, Angry Swallow, Mixer 2018 et autres twin-tip board's chez H2O Kitesurf Shop. Singshot Kiteboarding surfs et twin-tip avec la gamme de la marque et modèles de 2016 à 2018 dans votre Kite Shop H2O Kitesurf. Vous trouverez les modèles 2018 sur stock avec la Slingshot Tyrant, Celeritas, Mixer, Angry Swallow, Mixer & Screamer. Slingshot Celeritas & SURF TYRANT, Screamer 2018, Mixer, Angry Swallow, Mixer, Converter by H2O Kitesurf. Avec les ailerons supplémentaires que nous offrons en plus des traditionnels, vous allez pouvoir encore plus exploiter votre surf avec plus de grip et de tenue dans les coubes serrées... Le rêve ! A découvrir absolument: la toute nouvelle gamme de SURFS SLINGSHOT en construction carbone - bamboo. Slingshot fait très fort, loin devant la concurrence pour 2018, avec une très grande gamme de surfs en construction ultra solide et ultra légère. Avec un mélange de parties en carbone et parties en bamboo, le résultat est vraiment incroyable. De suite vous remarquerez le "poids plume" de ces surfs, ce avec une vivacité et de propriétés dynamiques bien devant les autres marques... le TOP simplement ! Chapeau bas pour cette construction, voici sur quoi j'attendais depuis un moment! Pour 2018, H2O Kitesurf met la paquet avec les surfs SLINGSHOT et on se "mouille" pour le prouvez en offrant en plus des ailerons supplémentaires en fibre bien plus rigides, plus dynamiques, plus rapides et agressifs... pour exploiter à fond la construction ULTRA VIVE des surfs SLINGSHOT. The Celeritas features a stout body, curved outline, mild rocker that blends from the center to the tail. It’s a stable ride that planes easily and has good upwind and light wind performance. For 2017, we’ve updated the classic thumb tail with a wing, which frees up the tail for a more snappy feel during turns. Large carbon stringer patches on the top and bottom give the board strength where it’s needed while keeping overall weight down. Additional carbon on the tail prevents breakage from heel impact. The Tyrant’s slender short board profile is designed for high-powered, high-speed, high-performance wave riding. Its rocker profile and rounded squash tail favor aggressive heel-toe edging, snap off the lip and locked-in bottom turns. SIZE: 6'0" x 18 1/4" x 2 1/4"
Unorthodox by design and radical by performance, the 2016 Screamer appeals to the new-era of kiters who want both solid wave performance and progressive freestyle capabilities out of the same surfboard. The board’s unique shape is based on Slingshot’s T-Rex design, the most notable feature of which is a wide, snub-nose. 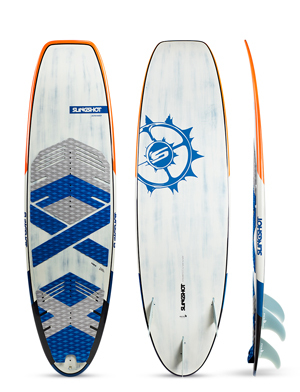 Offered in 5’2”, 5’4” and, new to 2016, 5’6” lengths, the Screamer’s stubby shape significantly reduces front-end weight, thus making strapless airs, spins and flip tricks easier than with more traditional shapes. Meanwhile, the board’s parallel rail outline, “pulled-in” thumb tail and single-concave rocker make it a fast, stable and slashy choice for all-around wave riding. New this year, the stomp pad and tail inserts have been moved back over the fins to allow riders a more aggressive stance and attack, whether riding strapless strapped-in. 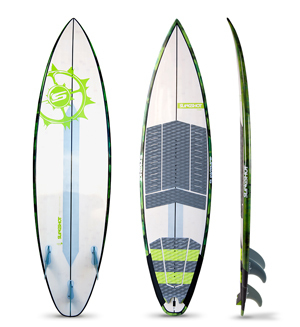 A 5’6” length was also added to the lineup, providing an excellent option for lower wind, smaller swell or larger riders. 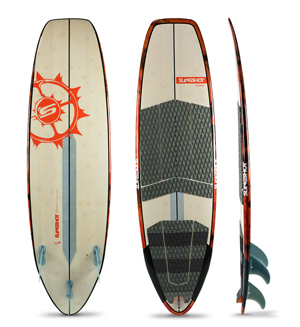 Back by popular demand for all of Slingshot’s 2016 surfboards is the three-fin setup incorporating the innovative new FCSII keyless fin system that enables riders to insert and remove fins with ease, and without the need for tools. The Screamer also comes with a set of Slingshot’s quick-adjust surf straps.